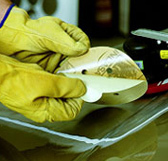 INDASA is one of Europe’s leading manufacturers of coated abrasive system technology. Fundamental to the company’s core values is the ability to provide market specific vehicle refinishing solutions utilizing key areas of expertise and manufacturing innovative abrasive systems to the highest quality and performance standards. The challenge facing today’s professional refinish industry is the ongoing implementation of innovative working practices to ensure efficiency at the highest quality repair standards. INDASA has always been committed to protecting the environment, actively working on the implementation of far-reaching programs to improve manufacturing processes and products.